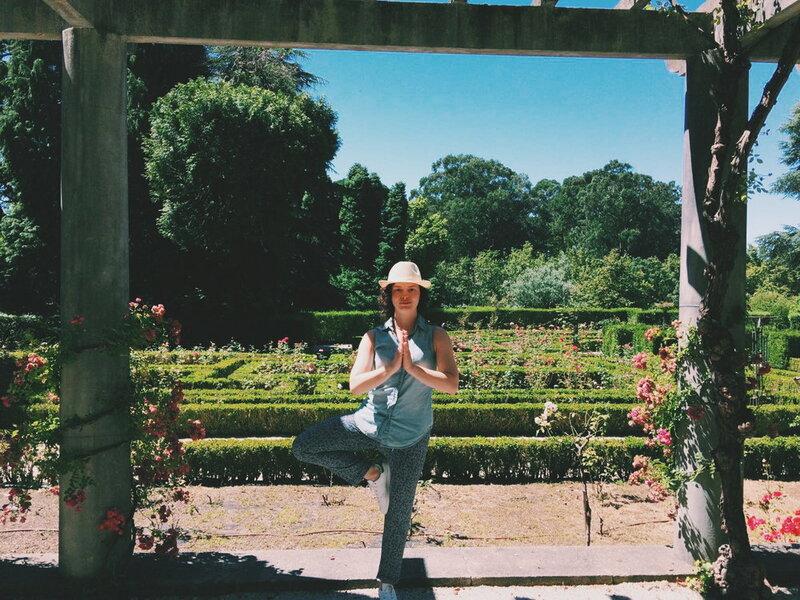 On the line of my last post about travelling with intention, I've decided to put into practice my own tips and see how I could really enjoy my first holiday of the summer, a long-weekend in Porto, Portugal . I was in Porto from a Friday to Monday afternoon, which was the perfect amount of time to really enjoy this little gem of city. For me it was a perfect choice to concentrate on visiting just one city, instead of doing a whole itinerary because it really gives you the time of savoring the place and melting with the local culture and people. I often hear people leaving for holidays with the plan of seeing as much as possible in a very short period of time, and I don't share this point of view. I think that nowadays our lives are so busy and filled daily that filling up also your holiday time is a recipe to come back home more tired than when you left ! I can relate to the "fear of missing out" on things to see and do, but the truth us that this pressure is only in our heads, you don't need to visit it all and very often when I pushed myself on the run to see as many monuments and places as possible, the result was that I could hardly remember them at the end, and all was left was pain in my feet and a vague memory of sweating under the hot sun queuing for who knows which tower/museum/insert your top place to see here! HOW TO APPLY THIS TIP? I'm not saying that you should not schedule anything in, in fact scheduling some fun activities or tours in your trip can be a great idea to try something new or visit something special like a wine tasting or as we did a surf class, but leave enough space for spontaneity so that you can get lost in the city. And don't be afraid to just stop looking at the map and just wandering around ! I love the idea of just walking around and having enough time to get lost, and ending up by chance in a local fair or a super cool street discovered by turning the wrong way. It was by applying this tip that I turned the wrong way and ended up in the hipster street of Porto ( photo below ) , Rua Miguel Bombarda , full or art galleries and this awesome street art! This is quite related to the previous point. Especially if you work hard all-year-long there is a high chance that you're placing quite a lot of expectations on your time on holiday. You count the days missing, check the wheater forecasts a million times, and hope this holiday will give you ALL that was missing during your year. You basically create an utopia of how the place will look like and all the fun you'll have. That's quite a lot of pressure to place on a single holiday! It often looks like getting on a plane all excited and then getting off and feeling suddenly disappointed because the landscape it's not what you expected ( hint : what you saw on a disney movie/fabulous retouched photo someone online) and all your dream holiday hopes are gone already. I have to admit that since I was a little girl I never placed much expectations on the places I visited. I was just showing up, big eyes open and enjoyed what was in front of me. But I saw a lot of family members or friends fall into the "expectation" trap and it was pretty sad to see how the place they visited didn't correspond to the dream in their head. Simply don't over research about the place you're visiting and don't look at too many photos. It's ok to have a general idea of how the place will look like, but don't binge watch photos and videos of other people visiting it before you! Let your own experience be yours and unique, and let the city surprise you in unexpected way. Like when I ended up in one of the main squares of Porto and discover this amazing architecture ! The two previous tips really help this one. When you're traveling at a slower pace and without expectations, being present is much easier. It's the presence that allows you to really soak in a beautiful view, savor a delicious meal or drink, and remember this experience in the future. Disconnect from technology ( and it wasn't so hard since I didn't have a constant internet connection and the battery of my phone died often) and use your phone only to take photos if you don't have a separate camera. Seat around . It basically mean don't rush walking everywhere like you usually do on a Monday morning. Take a pause and just seat on a bench. Enjoy the view, eat an ice cream and just do NOTHING. This moment will probably be unforgettable. Take pretty photos : I've found the fact of stopping and taking a photo very mindful. Especially if you take the time of styling the photo a little bit ! Chat with the locals : apart form creating a beautiful cultural exchange, chatting with the local people allows you to just stop and observe,and learn from their lifestyles. I've learned the importance of this tip during the holiday, because after a couple of days I was feeling a bit off and tired. So it's super important to bring with you a little morning routine similar to the one you do at home. I have quickly found that my body was stiff and tight from walking around and the different climate and habitudes, so I re-introduced a shorter version of the yoga routine I do at home, even just 5 minutes of stretching with sun salutations do the trick and can put you back on track! Another useful part of my routine at home is having breakfast quite soon after I get up. I cannot wait too long before eating. And this means that when you travel sometimes you cannot eat in your hotel room straight away, so it's a good habitude to take some snacks and maybe tea bags with you on the journey so you always have something to grab in the morning and you'll not find yourself walking around the city desperately looking for food! Before leaving for your holiday take a note of the things that help you feeling better in the morning at home. It may be exercise, journalling, eating a healthy breakfast.... So then you can get organized and take with you the essentials to make you stay more pleasant from the beginning of the day!